Hi, everyone. I hope you had a fantastic Thanksgiving! It’s taken me a little longer to get back into the swing of things, so you know that I milked every second of the holiday weekend and then some. I didn’t head out and shop on Thanksgiving night or in the early hours of Friday morning. I don’t do well in crowds, so my sister and I ventured out around noon on Black Friday…and found a relatively reasonable shopping scene. There were a lot of people, sure, but no more than what you would find on a Saturday a couple weeks before Christmas. I didn’t really have anything in particular in mind in store, but I did walk away with new workout tees (these are insanely soft!) 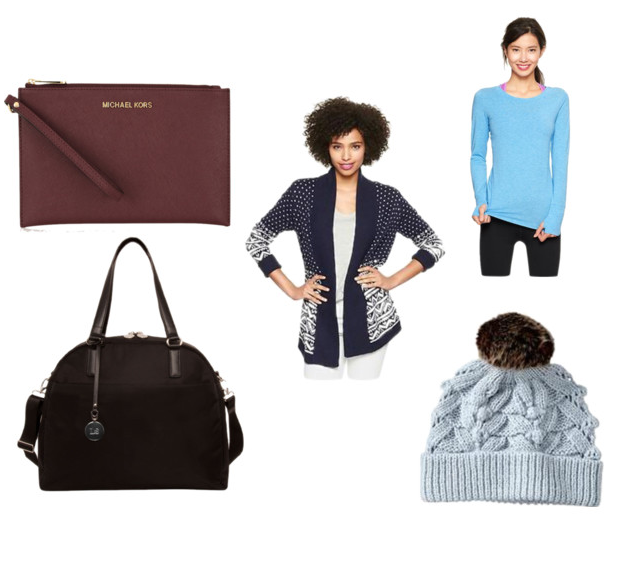 in several colors, this cozy cardigan (also comes in grey), and this hat (in grey, without the pompom) to replace my dingy one, all for 50% off at Gap. My bigger purchases were done through the web. I’m hoping to take a trip to the Philippines with James soon, and I had this OMG bag from Lo & Sons in mind as my plus one carry on. When I saw they were going to be 30% off, I had earmarked it as my big purchase since it’s been awhile since a discount that substantial had popped up. In the end, I went with classic black with silver hardware. The only “spontaneous” purchase was this pouch (similar) from Michael Kors from net-a-porter’s end of season sale. The description said it was meant to be a travel wallet of sorts, with slots for cards and enough room for your passport and phone. I was intrigued since I currently don’t have a travel wallet and clicked it home to me. We’ll see if it makes the cut. And that’s it, aside from these black/grey tech gloves snagged for $8. Best $8 I’ve spent on my fingers thus far. Did you do a little holiday shopping over the weekend?